For weeks we have been seeing tantalising glimpses of Fair Isle knitting emerging from Susan’s bag. A sleeve here, half a back there. 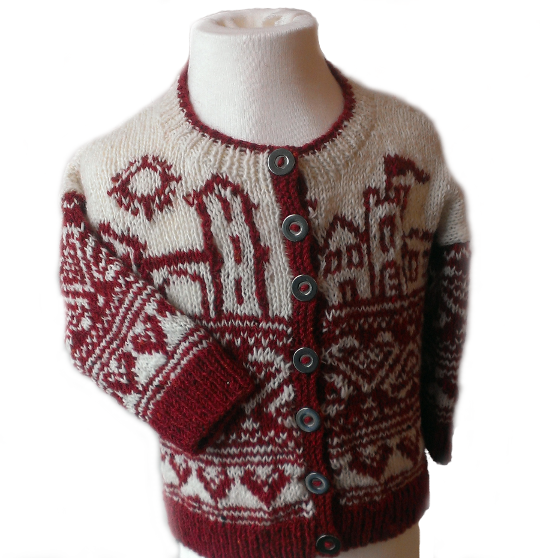 Today we arrived to the delightful sight of this little cardigan with all the ends weaved in and the buttons sewn on. And it is SO CUTE! Little Bo: there are hearts, stripes, a seaside town and a sunshine! The pattern is from Martin Storey’s Aran and Nordic Knits for Kids, and Susan knitted it on spec in Rowan Fine Tweed. In her words, “it’s quick, it’s lovely and the pattern’s very easy to follow (especially if you do a small size)”. Rowan Fine Tweed has a rustic look, with little flecks throughout the yarn. It is a thick-and-thin single ply spun from 100% wool and knits up to a standard 4 ply tension. It’s maybe not a good choice if you want a totally even texture, because of the way the yarn goes from thick in one bit to very fine in the next bit, but it looks absolutely wonderful when it’s knit up. A word of warning, however: for sewing up, it's an absolute pain in the neck. It keeps breaking. In order to avoid this, or at least to minimise the damage, it’s important not to tug too hard on the yarn when sewing it up. The red (369 Bainbridge) and cream (376 Bell Busk) shades give Little Bo a traditional Nordic feel, but you could definitely get creative with your colour choices. I think it would also look really cute in yellow with navy contrast, or a dark grey with cream.